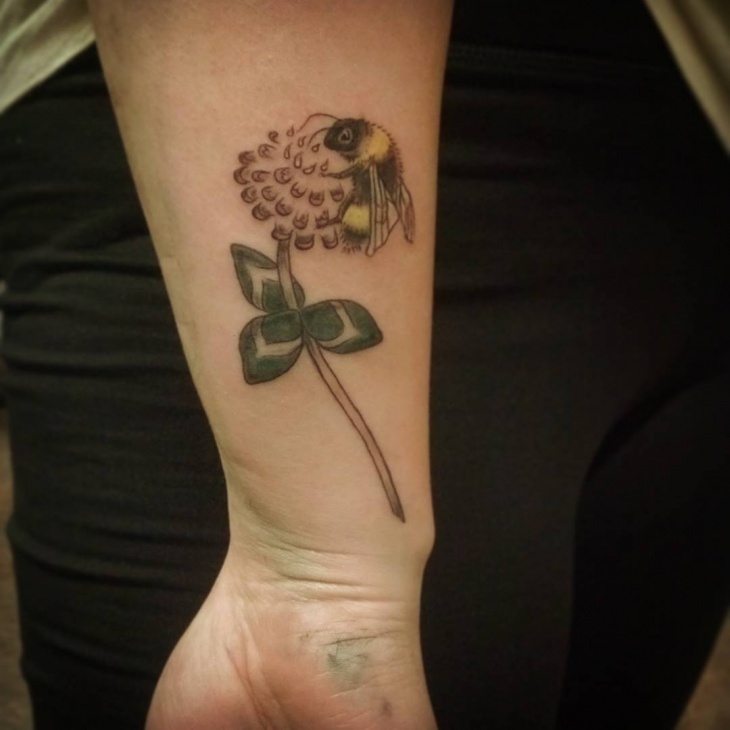 There is always a meaning or connotation to the tattoo design that you choose to have. 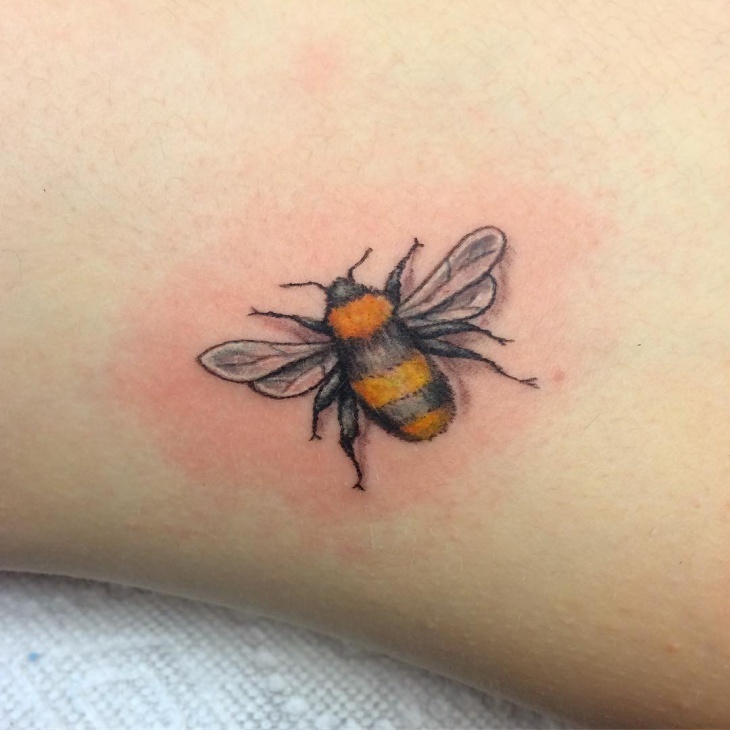 A bumble bee tattoo signifies transformation. 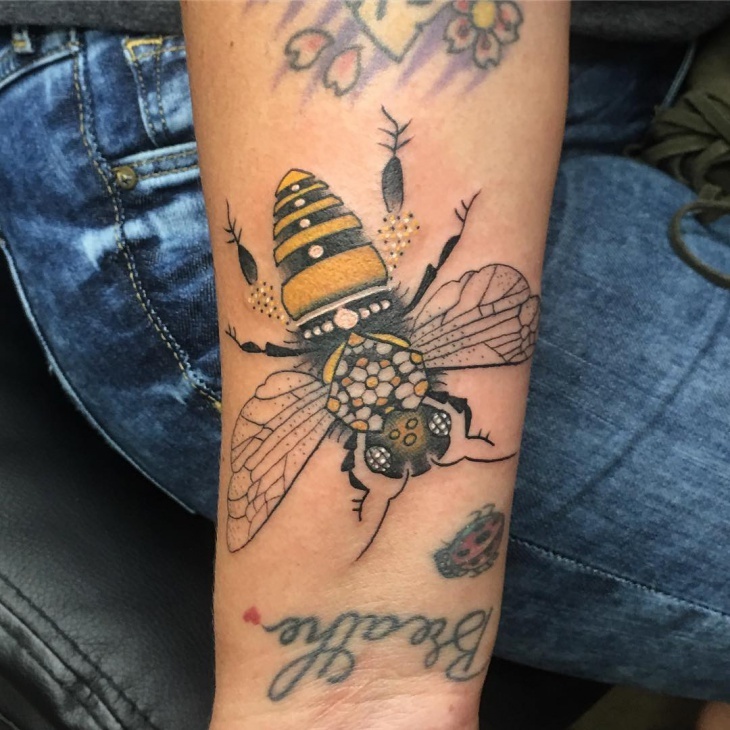 If you are seeking some sort of change in the waking hours of your life, this tattoo design can signify the same. 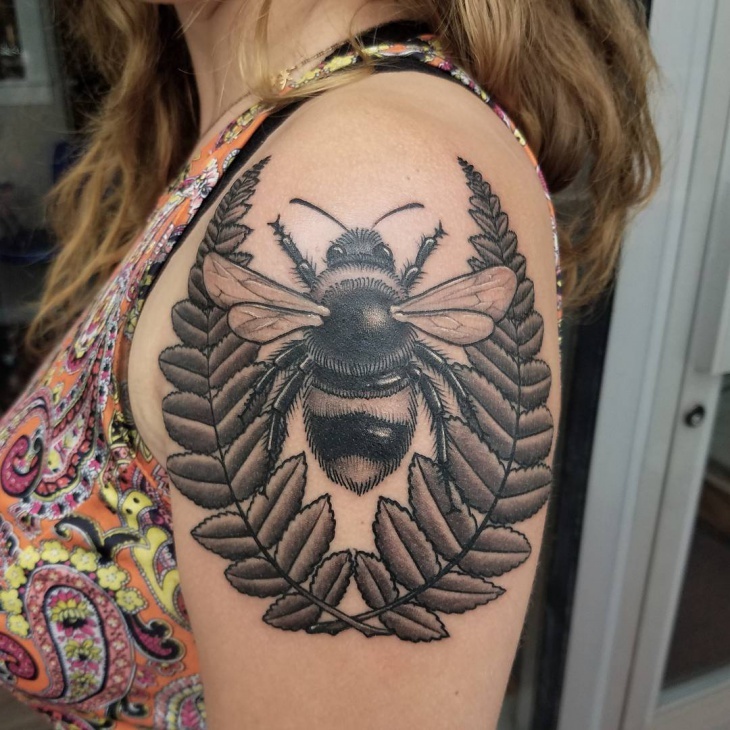 Bees have represented various symbolisms in folklore. They represent sexuality, fertility, and also hope. You can wear this colorful tattoo on the arm or the palm and also incorporate a heart tattoo along with it. 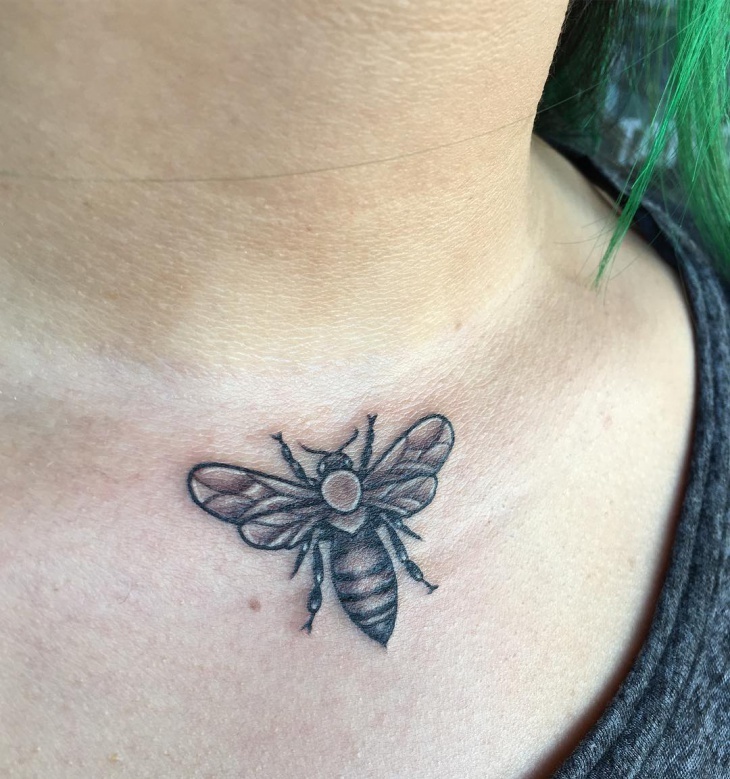 A tiny bee tattoo on the neck, suits young girls than boys. 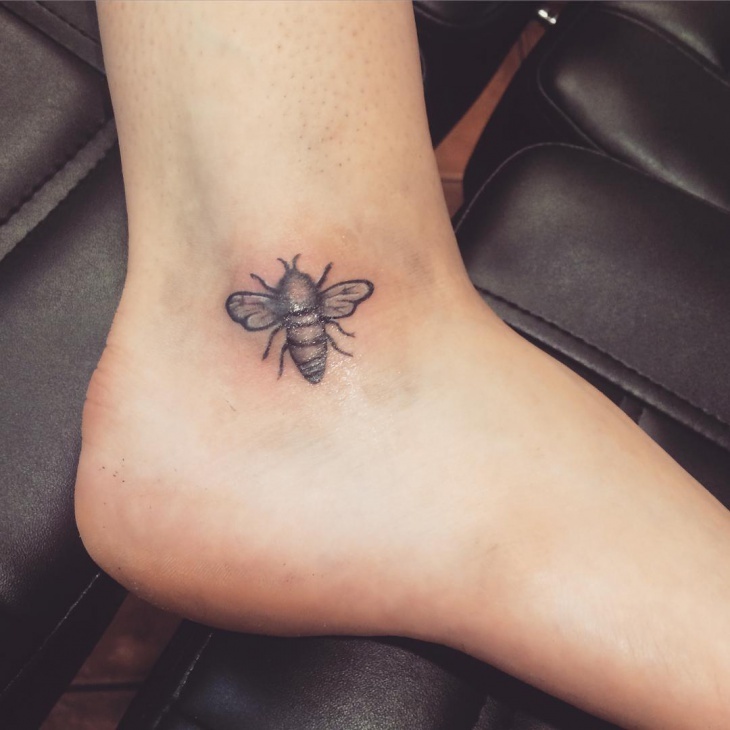 Bee tattoos are atypical feminine tattoos. Boys who are in the scientific field of biology, can wear this tattoo. You can try insect tattoo like that of dragon fly motifs. 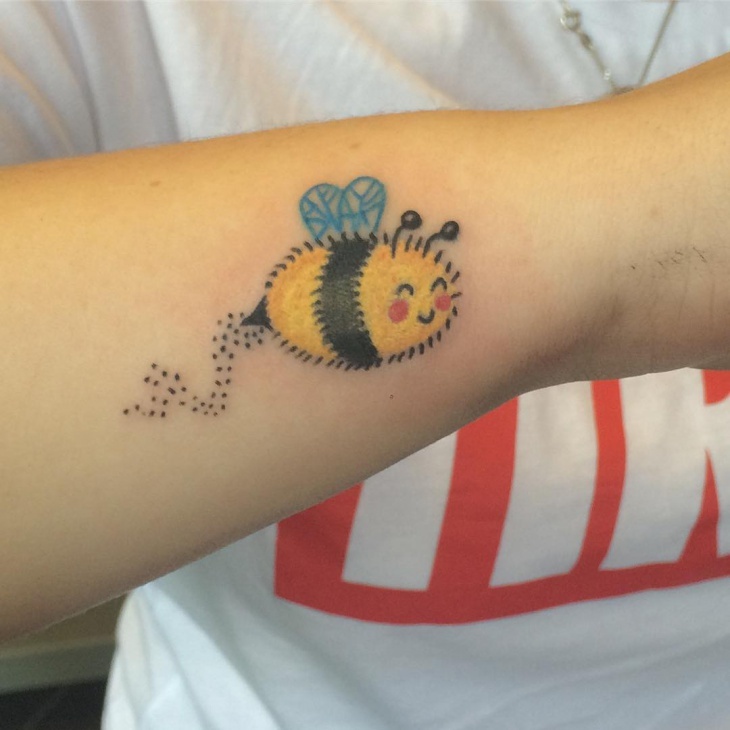 This is a cute and a cheerful motif of a happy bumble bee drawn in caricature style. It is drawn on the hands and is suitable for adolescents and teenagers. 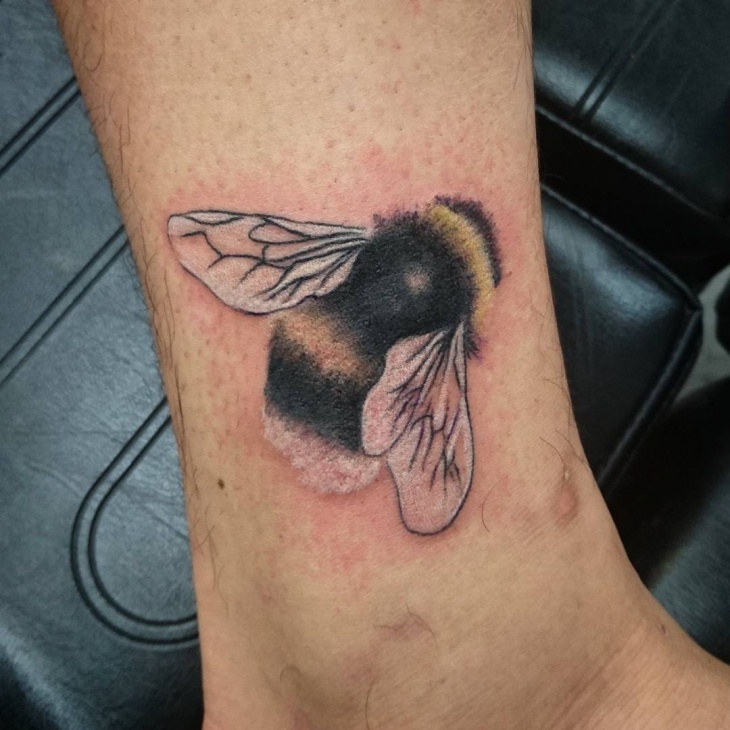 This is a highly elaborate tattoo of a large sized bumble bee. 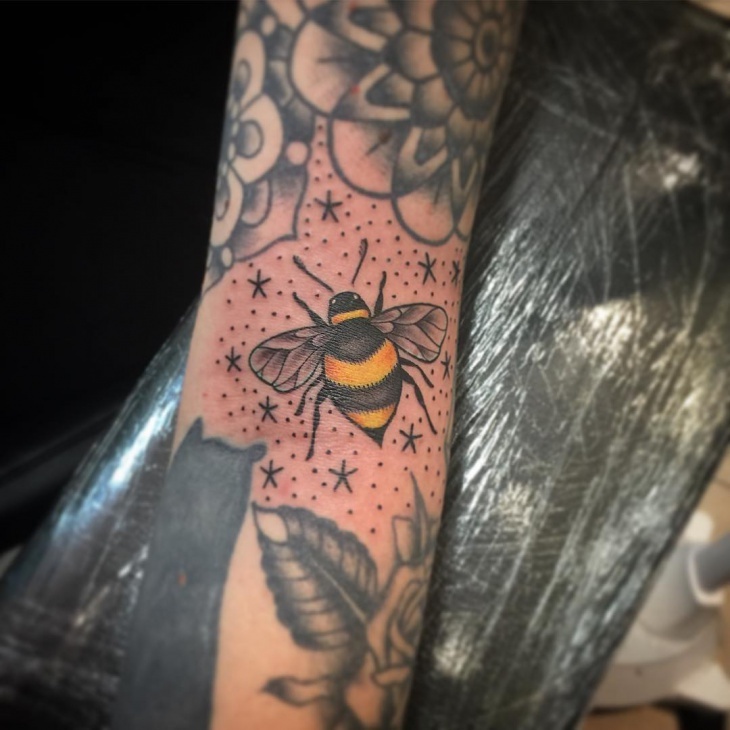 It is drawn on the hand and can be worn by male or female below the age of thirty. Also, tattooed is the text below the motif of this design. 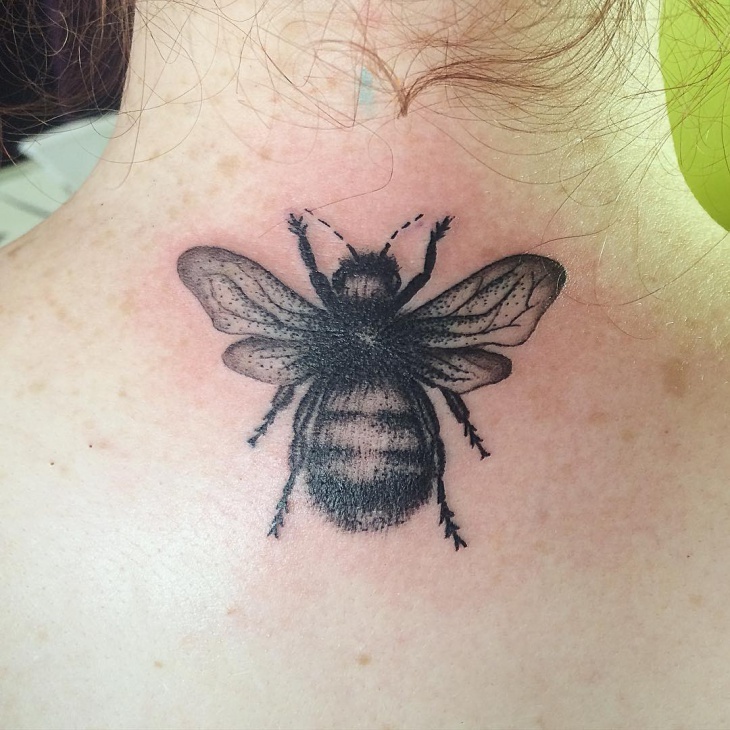 This is an artistic tattoo of the insect in dark black ink on the neck. Male and females of any age group can wear this design. 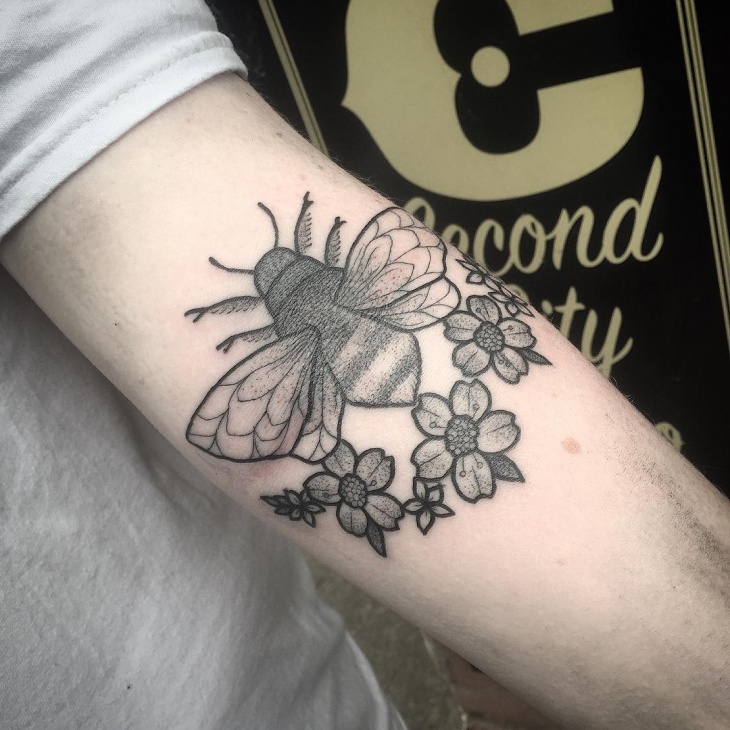 This is a simple design for those who love butterflies and bees. You can also wear a beautiful butterfly tattoo on the visible area of your body. 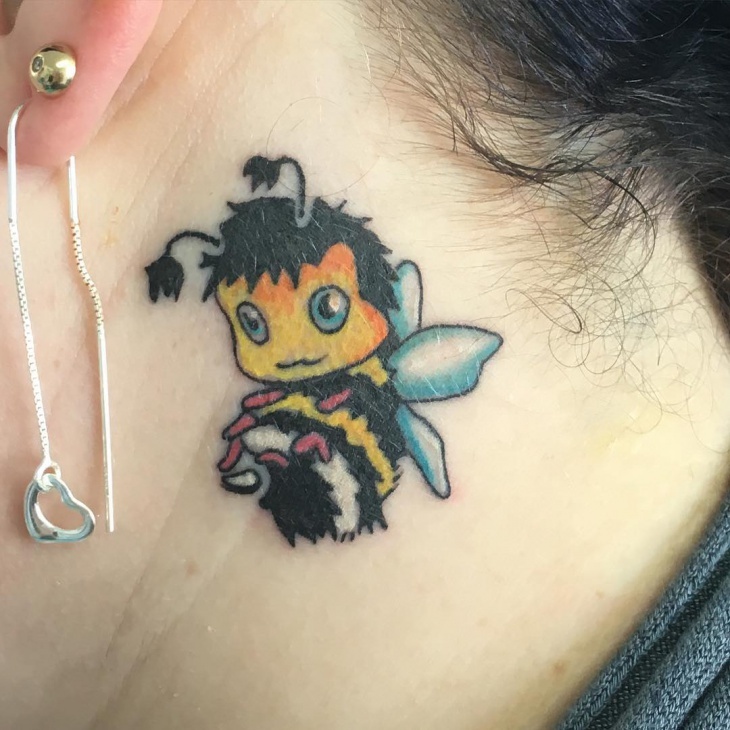 This is a super cute design of a flower bee with a human face drawn in different colors. It sits behind the ears. 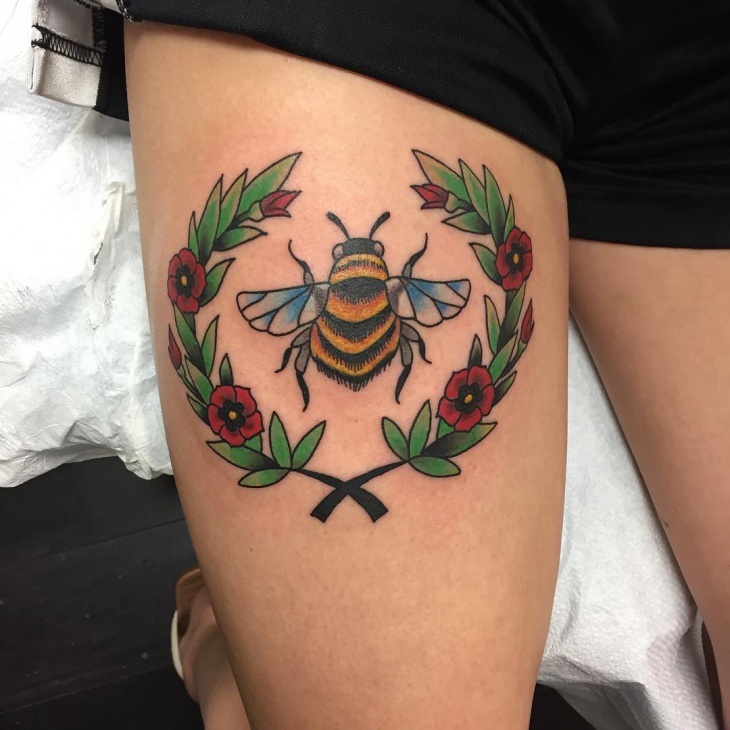 This tattoo design is mostly suitable for females. 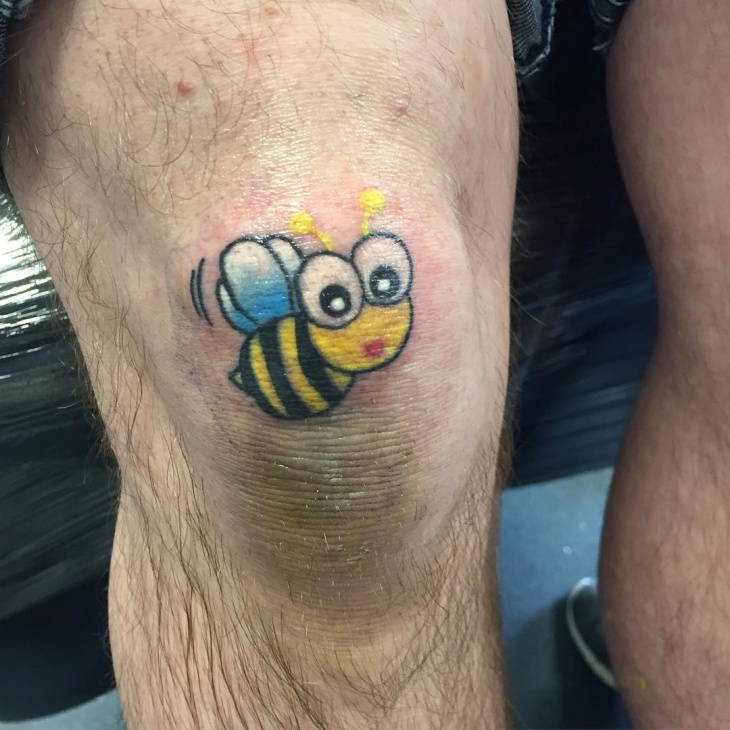 Even if you are a metrosexual male, do not try this tattoo on. 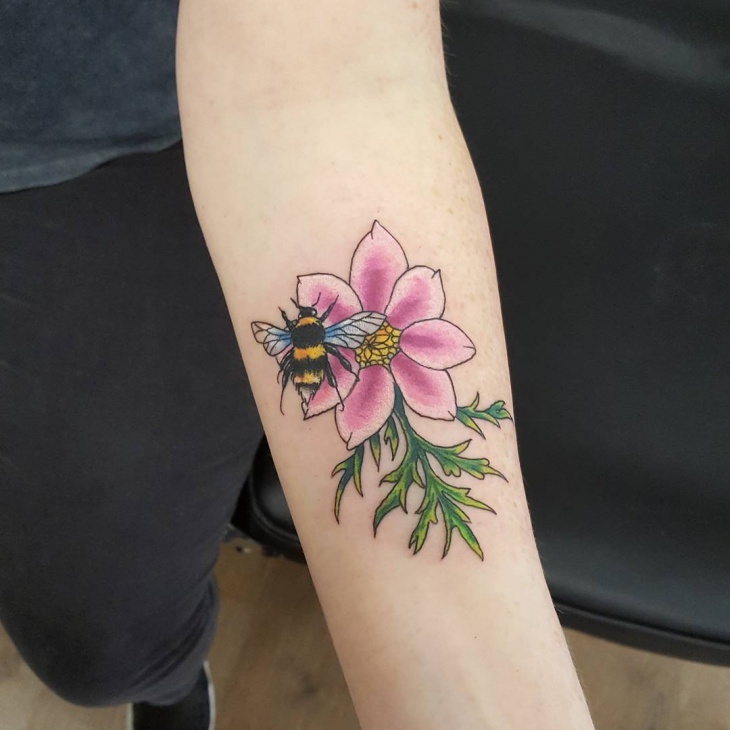 A pretty tattoo design of bumble bee sitting on a large pink flower is drawn on the hand. 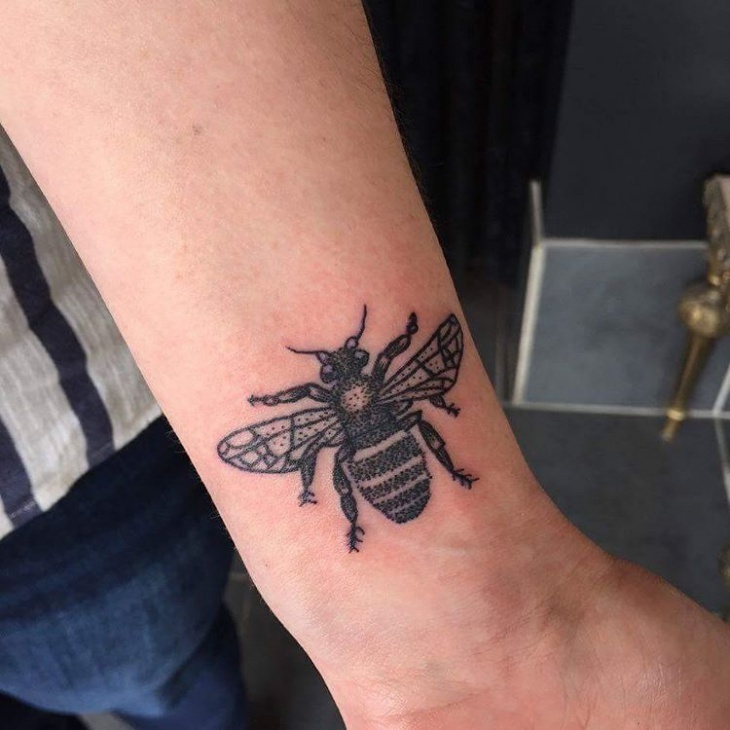 This tattoo design is suitable for women and girls. Men can avoid this tattoo designs, even if they are teens experimenting with various motifs. 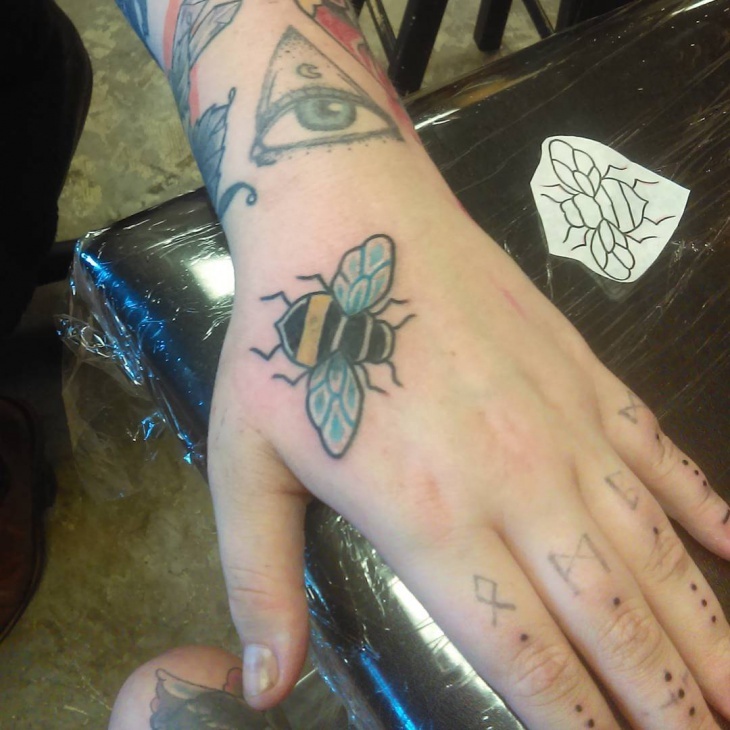 This is an elaborate bumble bee motif that also has floral motifs inked in black color throughout the hand. The floral tattoo is that of a large flower and the shading of these motifs are done with a lot of details. 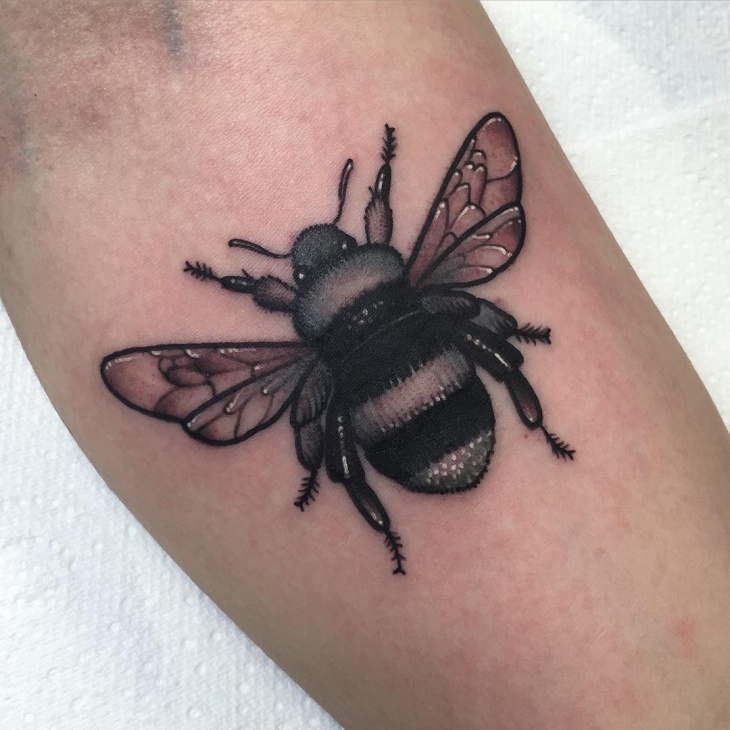 A beautiful black bee tattoo design that also has three flower motifs at the bottom of this tattoo. This is the kind of motif that is suitable for men and women. It can go well with most of the garments. 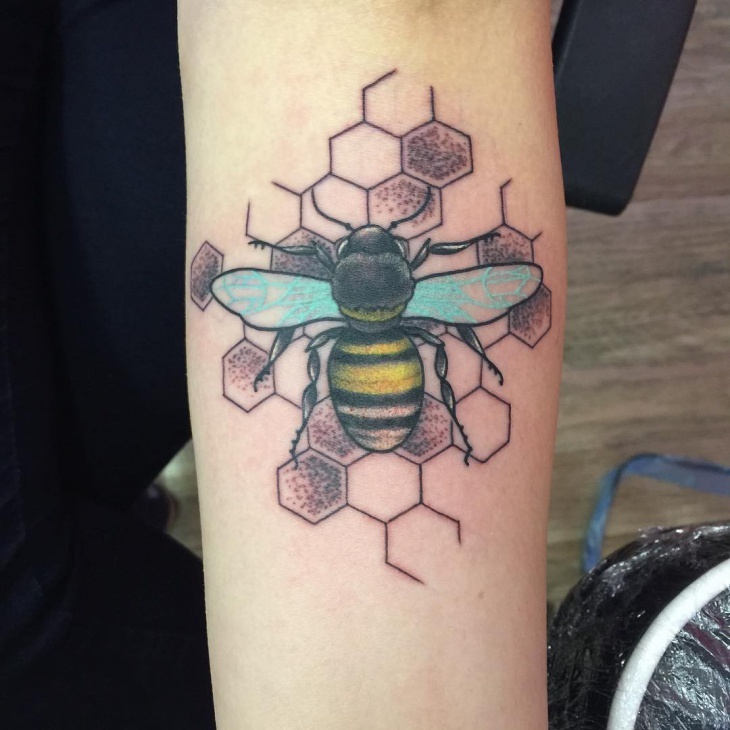 Bee designs are not as popular as floral or butterfly designs. You can also get inked in the koi fish tattoo. This is a feng sui symbol of abundance and prosperity. There are umpteen options to get inked in the animal or floral motifs. Usually, the designs of these two motifs are combined into an interesting collage of elements for tattoo design.